The Lonely Planet’s guide to Cycling Britain features a total of 29 great rides through three different countries: England, Scotland and Wales. 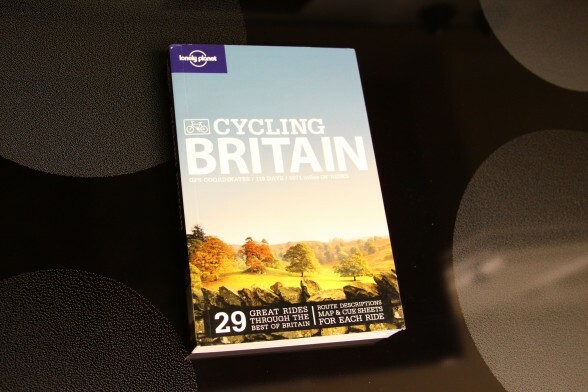 While the book does not provide long-distance cyclists with a straight route from one side of Britain to the other, the book does give you information on more than 5,000 miles worth of rides in some of Britain’s most scenic, historic, and interesting places. If you are planning a trip to Britain any time soon, the Lonely Planet’s guide to Cycling Britain is one resource I highly recommend. Like all of Lonely Planet’s cycling guidebooks, Cycling Britain contains a large color map of the three countries covered in the text: England, Scotland and Wales. Each of these geographic regions is then broken down even further – each region listed with some basic information about the area, a few color photos, and a ton of detailed info on the various cycling routes in that particular area. Once you’ve decided on the region you most wish to visit, flip through the pages until you find a ride that looks enjoyable and fits your schedule. The rides inside Cycling Britain vary in length from short day trips (only a couple hours in length) to much longer, multi-day adventures (such as the 20-day, 1051.2 mile trip from Land’s End to John’s O’ Groats). After finding a desirable ride, you’ll see that there is a ton of information provided for you about the route you will soon be traveling. Each route in the book contains information on how to get around the area (by bus or train, etc. ), some basic history of the area, detailed cue sheets which give you turn by turn directions (shown below on the right), elevation charts for your ride (shown below on the left), and some brief information on the people, places and things you will surely encounter while out on your bike ride. You’re even provided with GPS coordinates, which you can use to more easily navigate your way along your desired route. At the end of the book there is even more information. Here you will find some basic information about bicycle touring, what to carry, how to pack, weather to watch out for, etc. There’s also a small section listing some basic bike repairs you may need to perform while out on the road and a small section dealing with stretches you can perform and medical safety procedures that should be taken in the event of an emergency. Like all of the Lonely Planet guidebooks, Cycling Britain is an impressive resource for those wishing to spend some time cycling their way through the featured land – Britain. The book is well-designed and the ifnormation is easy to follow. The only negative to Cycling Britain is the book’s overall size. While the book itself is really not all that large or heavy, the book contains so much information that you probably won’t want to carry the entire book with you while you’re traveling. In most cases, you’ll only be using a small portion of the book once you get out on the road. So, my advice is that you buy the book, photocopy the pages you need in order to complete your trip by bike, and then carry those pages with you on your travels. This way you don’t have to carry the entire book around with you, but you will still benefit from having the photocopied pages with you while you are out there on the road. If you are planning a cycling trip in England, Scotland or Wales, be sure to pick up a copy of the Lonely Planet’s guide to Cycling Britain. The 2nd Edition was published in July of 2009 and can be purchased brand new for $24.99 USD or £15.00 UK. The cost is much less if purchased through Amazon or similar online retailers. This entry was posted in Bicycle Touring Pro Articles, Books, Europe, Locations, Main Articles, Planning, Product & Service Reviews, Products, United Kingdom and tagged bike london, cycle london, cycle routes london, cycle routes uk, cycle touring, cycles uk, cycling britain, cycling england, cycling holidays uk, cycling scotland, cycling wales, lonely planet, mountain biking uk. We actually completed the Lands End to John O’Groats route from this book last year. Although it’s not the quickest way to complete that particular trip it certainly is one of the most scenic and interesting. I whole-heartedly recommend this book, and the others in the series (we’re currently looking at France).